Outrageous fun for the whole family! Cranium Family Fun features a variety of hilarious activities that will have everyone laughing, high-fiving, and working and playing together! 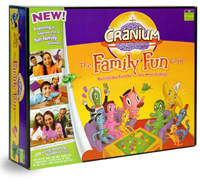 With colorful Cranium Cubes and fun Flipper Frogs, The Family Fun Game delivers the ultimate game night! Can Mom flip a frog through a hoop you've sculpted out of clay? Can you pass the Cranium Cubes to Dad ... without using your hands? Can you work together to write down three of the top five most popular pizza toppings? In Cranium Family Fun, everyone will have a chance to shine as you perform wacky stunts, act, sketch, guess, sculpt with Cranium Clay, and more! And the short play time (about 40 minutes) makes it easy to squeeze in some laugh-out-loud family fun before dinner or after school. The game board, 400 outrageous cards, Cranium Clay, 6 Cranium Cubes, 4 Flipper Frogs, a die, timer, Cranium pad and pencil, and 2 mover pieces.